What does disaster service mean? Disaster service means all activities authorized by and carried out pursuant to the California Emergency Services Act*. Who is included in the disaster service worker status? 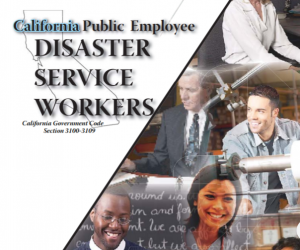 All public employees are included in the disaster service worker status which are all persons employed by any county, city, state agency or public district. What are the scope of duties of employee disaster service workers? protection of life or property or mitigating the affects of an emergency. How are public employees assigned disaster service activities? What is the oath or affirmation referred to in the government code? that declares them to be disaster service workers in time of need. When do public employees take the oath or affirmation? Most public employees sign the oath or affirmation during the hiring process and it is kept with the employer. Do public employees acting as disaster service workers get paid? Public employees acting as disaster service workers get paid only if they have taken and subscribed to the oath or affirmation. Can disaster service workers be sued for actions taken while performing duties? Public employee disaster service workers for nonprofit organizations and government cannot be held liable for their actions during a disaster while acting within the scope of their responsibilities. What if public employees are injured while acting as disaster service workers? guidelines as with all employees within their agency.